March 3, 2007 "The Arts of March"
Art & Fine Craft Show celebrating Maine's beauty in many forms. on walls on display and not in individual booths with the artists. "Sportsman's Choice" award will be voted on by the general public. Located on the Bethel Common, One Broad Street, Bethel Maine 04217.This event is being held on the beautiful village common in the National Historic District of Bethel, Maine. In addition to the art, the fair will have musical entertainment and will include a special young persons' area where children will be able to take part in a variety of activities. Several local eateries will be serving their special fare for purchase as well. I will be located in booth #14 to the right of the Chamber info tent and raffle area. There will be a total of 50 artist booths set up for your enjoyment. Sorry no rain dates. Located on Main Street downtown Winthrop. Put on by the Winthrop Area Chamber of Commerce. This show is open to 84 artists, sculptors and photographs. There will be a general display of art work for the public to purchase. Art show purchase prizes to be purchased by participants for $350.00, also Art Show Judge's awards. Look for display maps set out for locating your favorite artists. Sorry no rain dates. The Artist's Best Friend" CAG online Art Show will be live April 1st 2007. This a newly formed group of canine artists showcasing artwork depicting their own dogs or dogs that have been influential and inspiring to them. Below is a sneak preview of my entries. 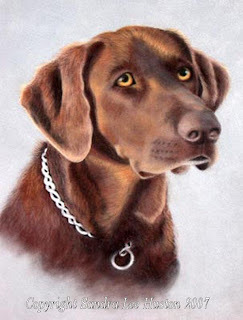 My best canine friend is our beloved chocolate lab, K-C. 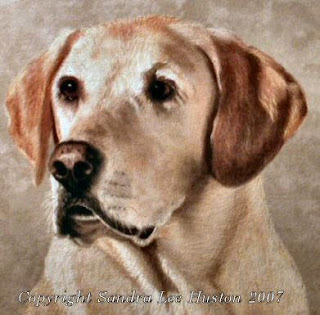 Her portrait is featured in a place of honor at the top of my pet portrait page on my website. (www.animalsinpastels.com/pet-portraits.html )This 11x14 soft pastel painting was completed when she was six years old and painted on grey tinted velour pastel paper. It was a joy to paint this particular portrait of her with all the different colors highlighted on her fur as she sat in the setting sun. She is now 11 years old and showing more white hairs around her muzzle and paws each day, but is still beautiful to us. My husband calls her my constant shadow, following me out to the barn each day, and curling up by my rocking chair when I read in the evenings. If I am working at the computer she is sleeping on her dog bed behind me in our office. Even in my studio while painting, you will find her napping at my feet and always runs to the door eagerly, if she hears "OK girl, time to take a break, let's go for a walk." K-C is the seventh dog my husband and I have owned and raised, each of the animals that have come into our lives throughout the past 30 years continues to weave a special place in our hearts. 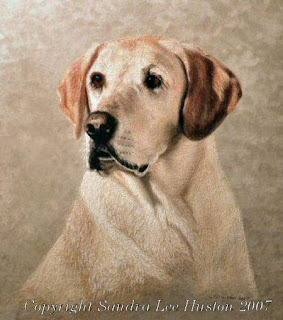 The love and bond between humans and animals are very unique and that special bond is the reason I have been painting commissioned pet portraits since 1990. Through my portraits my clients display the love and bond that they have developed with their animal companions and keep these cherished memories alive for a lifetime. 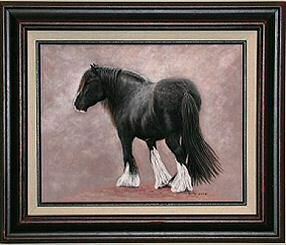 The Artist Horse as Muse Show is a show of the Equine Art Guild Artist showcasing their love of horses. The online art show will be live on March 18, 2007. Below is a preview of my submission. 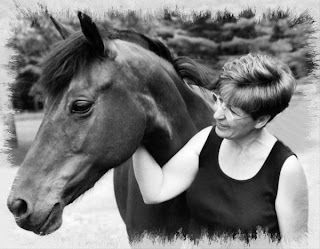 This photograph was taken in June of 2006 of my Morgan mare "Rosie" and I, by a friend and fellow photographer; Arlene McConnell. Rosie, who has filled the void in my soul since she came to us in 1994, is also a constant inspiration to me in my equine art. With Arlene's permission, I edited the photo by cropping and removing some of the background objects, enhanced the tonal quality by converting it to black & white, than added an artistic edging for this photograph submission of us together. My Second submission is an 8x10 digital reproduction titled ~ Celebrating the Love of Horses ~Available to purchase @ $25.00 +s&h. 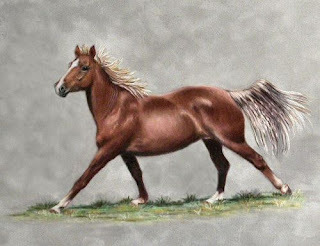 This reproduction is from my original pastel painting of my first horse "Misty" purchased by my husband for me in 1982. She was my childhood dream come true and I was very fortunate to have owned such a wonderful animal for my first horse. My fondness memory of "Misty" was when I rode her bare back on a snowy winters night with the full moon shining across the freshly fallen snow. Over the years we would jump fences fearlessly and complete our first level dressage test together. I will never forget my 3 year old son walking up to this mare in her stall after we first brought her home, telling her to back with authority so that he could pass, whereas this mare backed and then followed my son through the stall door and into the pasture. My husband and I both looked at each other and knew than that our son was safe with this mare. 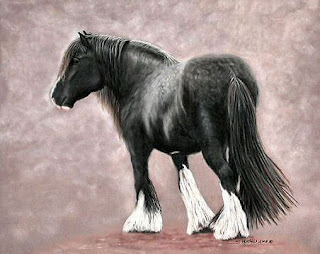 This print is actually from my original Morgan montage completed in 2004, painted in soft pastels on Moorman Suede board. 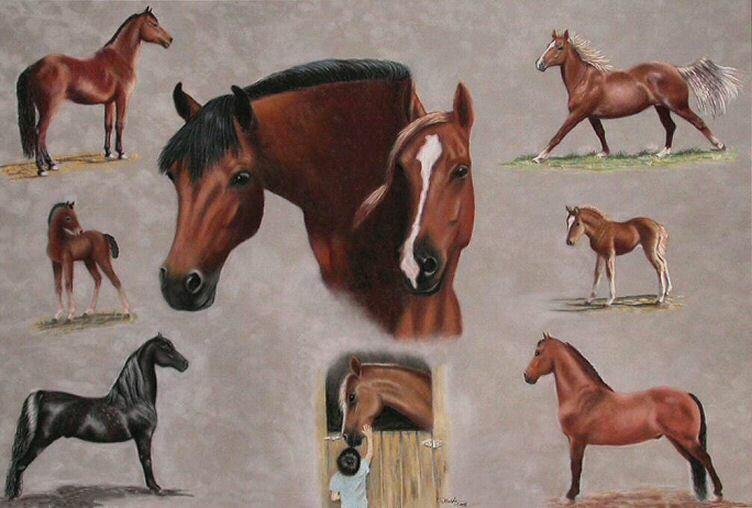 Since most of my time is spent painting commissioned portraits of other people's animals, I wanted to paint this montage for myself as a remembrance of the horses we raised. The original 24x36 montage is displayed in our living room and continues to evoke fond memories of our beloved Morgan horses each time we pass. If you would like to view the complete montage as displayed on my website, click here: www.animalsinpastels.com/images/morganmontage.jpg You will notice my Morgan mares depicted at different ages throughout their lives starting when they were just a few weeks old. I also added the stallion's portrait of each of my mares in the lower corners, "Immortal Command" on the left and "Merrilee Aquarius" to the right. I than finished the montage with a small portrait of my son, Christopher, meeting our first horse Misty when he was three years old.